To celebrate the launch of our new new website and online services and to encourage residents who aren’t using digital yet, we have organised ‘DigiFeb’ – a series of events and roadshows offering fun digital activities and learning opportunities across the Borough. 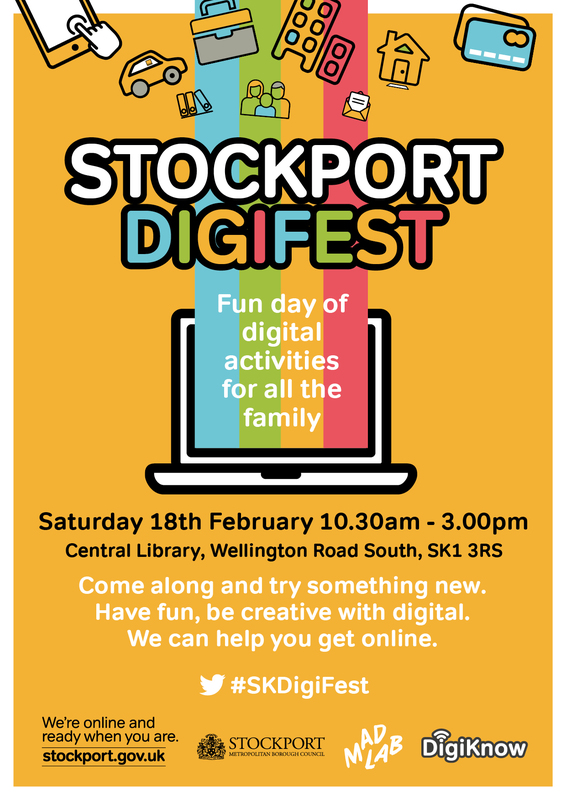 On Saturday 18th February we will be hosting Stockport’s first DigiFest from 10.30am to 3.00pm at Central Library and the Hatworks in Stockport. We’ve teamed up with Madlab for lots of fun family activities, including free coding lessons, tech workshops for all ages such as creating electronic badges with LED lights, 3D printing, Minecraft coding, gamecraft and much more. Visitors will also be able to learn more about getting online, staying safe online and the new features of the Council’s online services. Residents who aren’t sure how to use their computer, tablet or smartphone are encouraged to bring it along to our Digi Drop-in where we will help them work it out. Brinnington Digital Roadshow: 9th February 10.30am-3pm at First House, Brinnington. Learn new digital skills, how to use digital to find work, save money and get ready for school online. Find out more here. Love Digital! 14th February 10am to 3pm, Offerton Community Centre. Learn to Love Digital: get online, stay safe and save money online. Find out more here. Introduction to Digital Marketing Masterclass: 17th February at the Stockport Business and Innovation Centre. A workshop to help small businesses develop an online profile. Register for the workshop here. Hackfest: 21st & 22nd February at Fred Perry House, Conference Suite. This aims to encourage the development of coding skills in young people aged 14 to 18 and to involve businesses in setting coding challenges. Find out more here. Bridgehall Digital Roadshow: 27th February 10.30am-3pm at Bridgehall Community Centre. How to find work online, learn new digital skills and how to save money online. Find out more here. Advanced Digital Marketing Masterclass: 28th February at the Stockport Business and Innovation Centre. A workshop for small businesses that wish to improve their digital presence. Register for the workshop here. #SKhackathon: 4th March from 8am to 8pm at Fred Perry House. A ‘Hackathon’ to help connect local residents with their wider community. This is an event where professionals, amateurs and students (16+) with different skills come together to use data to solve a problem in a short amount of time. A further roadshow is also planned for Reddish; follow this blog or #DigiFeb for details and latest news.